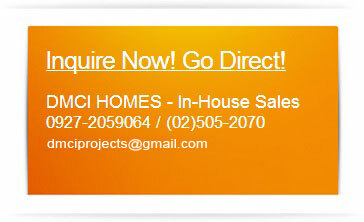 Accomplish the DMCI Homes Client Registration Form (CRF) provided by your Property Consultant. When registration is good, you may now choose which DMCI Homes project and unit you wish to reserve. Once your Property Consultant verified the availability of your desired unit, you may now make an official reservation with DMCI Homes. Your Property Consultant will now prepare a Standard Final Computation Sheet. Once you agree with the payment terms, your Property Consultant will help you accomplish your Reservation Agreement (RA). Your Property Consultant will assist you with the payment of your reservation fee (P20,000 for unit / P10,000 for parking), which is valid for only 30 days. A provisional receipt will be issued to you upon payment. Non-refundable. The following requirements should be submitted within 2 days from reservation date. Failure to submit the requirements may cause cancellation of the reservation. Photocopy of 2 valid government issued ID's (Passport, Driver's License, etc.) with 3 specimen signatures. Photocopy of Proof Of Billing Address (Meralco, Water, Phone bill, etc.). The Address must match with the preferred mailing address in the Reservation Agreement form. Signed computation sheet provided by your Property Consultant. Special Power of Attorney (if applicable). The Property Consultant will provide the SPA form. Filled up Auto Debit Arrangement Form (ADA). BDO or BPI accounts only. DMCI Homes head office will call and verify your purchase of the unit with DMCI Homes and your identification. Upon verification the Notice Of Approval (NOA) will be released. Once the CTS or DOAS is printed. Signing of the documents will proceed. Post Dated Checks should cover the down payment period and the balance (if In-House Financing) or an option of Auto Debit. Provisional receipt will be issued upon submission of the Post Dated Checks.